Lets learn a simple and easy vegan side dish recipe today. Horse gram (MUTHIRA) and banana stem(VAZHAPPINDI) thoran (stir fried). A complete healthy side dish for lunch. As the horse gram benefits for weight loss, most of the people include this horse gram in their diet. 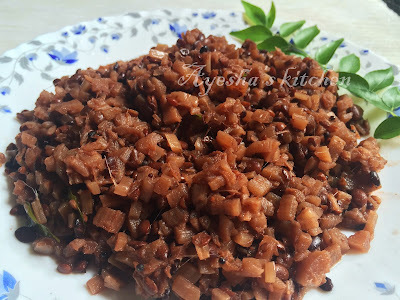 Do try this tasty healthy side dish and stay healthy. One of the best veggie side dish recipes for a healthy living. Banana stem contains many nutrients that are vital for a healthy body. People who are trying to shed weight (loss weight) prefer banana stem juice which helps to loss weight effectively. This banana stem juice is very good for people who are suffering from kidney stones. When speaking about horse gram...horse is known to reduce body fat which are root cause for obesity. Horse gram benefits for weight loss, digestion, common cold, fever and like so. The recipes of horse gram for weight loss are very common and popular in South India. Remove the outer covering of the banana stem and get the edible part from inside. Cut it into small ring shapes and then chop them into small pieces. You can remove the fibre (naaru), while you are cutting into ring shapes. Cook the horse gram / muthira in a cooker for about 1 whistle and when nearly done add the chopped banana stem to it. Do not add more water. Add salt and cook it for again 1 whistle or till done. Now crush small onions and garlic cloves. Heat oil in a pan and when hot splutter mustard seeds. Then saute the crushed ingredients for a while and then add curry leaves, dried chilly and saute for few minutes. If there is excess water in the cooked mixture , drain or remove it and then add the cooked mixture to it and put salt if required.